The price of the Baba tangerine was not very high when the fruit first appeared on the market several years ago. Even when the price was high it only reached 2-3 yuan [0.30-0.44 USD] per 0.5 kg, and the lowest price was around 1 yuan [0.15 USD] per 0.5 kg. However, as more people became familiar with the Baba tangerine, the fruit became more popular, and the price has maintained a steady upward trend in recent years. Will the Baba tangerine suffer from the environmental impact of Shatang oranges? In 2018, Baba tangerines entered the market just before Chinese Spring Festival. At that time their price was around 12 yuan [1.78 USD] per 0.5 kg. However, during Spring Festival when Shatang oranges entered the market, the overall price went down. There was, however, a great disparity between prices, sometimes as much as 2-3 yuan [0.30-0.44 USD] per 0.5 kg. The Pujiang County Agriculture and Forestry Department, together with the Pujiang County Market Surveillance Department, announced strict regulations for harvest standards in order to guarantee the superior quality of the product variety. These regulations allow Baba tangerines to fully mature and preserve their juiciness and purity of flavor. The new regulations come into effect on January 10th, 2019. This is the beginning of a new sales era for Baba tangerines that begins in 2019. 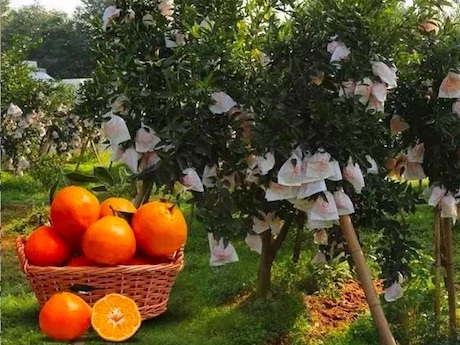 The Spring Festival is less than one month away and there is still room for the price of Baba tangerines to rise, but this development also depends on the volume in storage in production areas, as well as product quality, which will decide the future of the market.